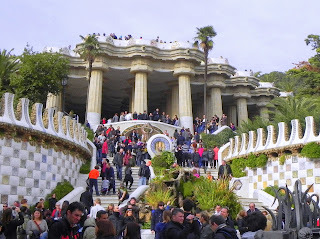 Last night we decided that today might be a good day to visit Parc Guell, seeing as it was a holiday and most shops and restaurants would be closed. I had loved the park when I was here twice before in 2002, and it didn't disappoint today. 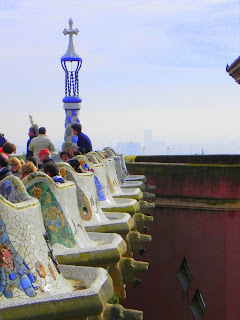 Although the place was crawling with Spaniards and other extranjeros (foreigners) who apparently had the same idea as us, the magic still abounded. Sube, sube, sube. The long walk up, up, up to get to the park. We met at the 2nd metro stop for the park and chose the route to the back entrance. 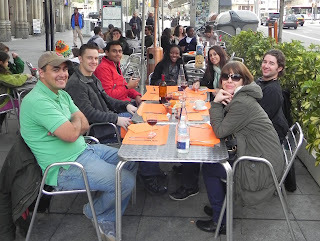 Thanks to social coordinator Shabnam, we also picked up a few new ESADE friends along the way. La Miranda. The first thing you see when you enter the back trails is a lookout point over the city. 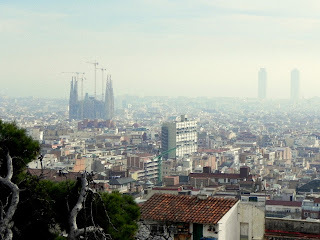 To the left is the Sagrada Familia, which is Gaudi's famous cathedral that is still under construction to this day. We haven't made it over there yet, but it's definitely on the list. I absolutely fell in love with this door. Brian didn't quite see the same appeal, but I would LOVE to have this door in my house. I have a new appreciation for doors being in Europe. They all seem to whisper to me, like they have centuries worth of secrets. 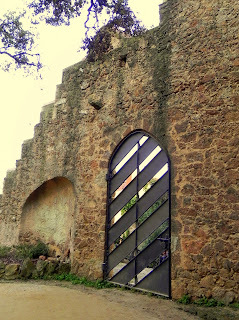 Although Parc Guell was only built at the beginning of the 1900s, I know this door has lots of stories to tell too. See me holding my jacket? The weather has been really unpredictable. One minute it's cold and we're bundled; the next it's actually warmish feeling and sunny and you're peeling off layers. It was a beautiful day for a visit to the park. These amazing columns were built this way to support what was to be a road overhead. 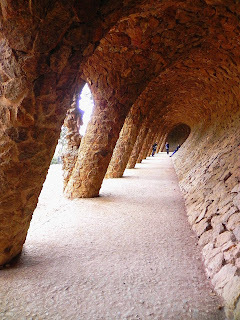 Gaudi was an engineer among many things, and the whole park is filled with such well-thought-out marvels. Gauidi's famous mosaic seating area. Its curvaceous design was supposed to allow people to sit and chat privately in the ergonomically correct nooks. 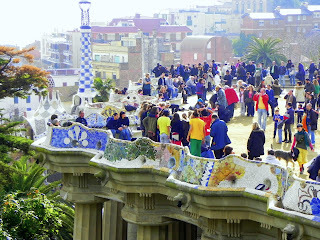 The park was actually masterminded by Gaudi as a gated-community for the wealthy but the women of the time couldn't see being away from the city's cultural center. 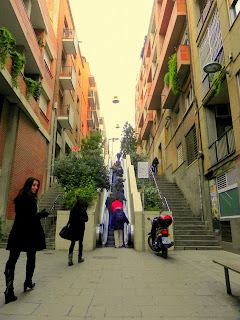 According to our guidebooks, he was about 100 years ahead of his time, as the surrounding neighborhoods are now some of the most expensive and most exclusive in Barcelona. The beauty of the lines and the colors and the thoughtfulness of the structures is so enchanting. I can't wait to come back again and again to soak up every little detail. My favorite Spanish model. See the way the pillars in the back have plants atop their wide bowls? 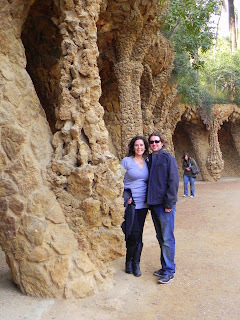 Gaudi apparently designed them to mimic the trees throughout the park. Cool, huh? 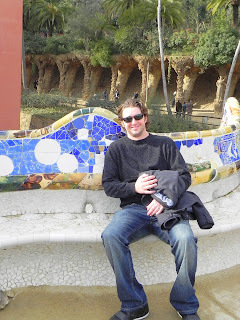 I have a new appreciation for mosaic. The park is full of pleasant little surprises like these. 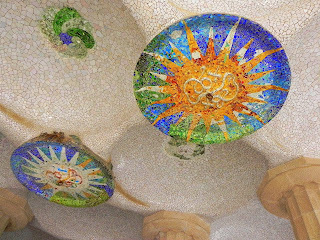 This is the ceiling directly under the mosaic seating area. 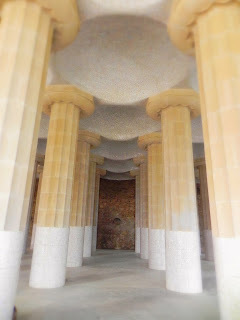 It is a maze of columns with these half-sphere indentions overhead. The columns I mentioned above. I so appreciate this rare shot without a tourist meandering through! 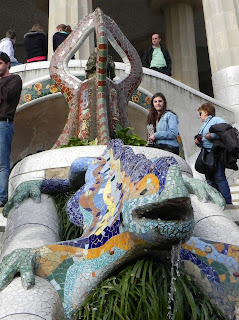 The oh-so-famous mosaic dragon. You can't tell here but it was surrounded by a mob of tourists armed with flashing cameras taking photos of their loved ones who took turns lunging at the dragon and forcing others out of the way. It was quite the sight! He's a star. We took advantage of another menu del dia after our jaunt around the park. The group is ever-growing! From left to right: Cliff from Cornell, Kyle from Cornell, Harish from Kellogg, Allison (Ali) from NYC (not sure school), Shabnam from UT, Jennifer from Fordham (NYC) and my Brian from UT! This is Shabnam's gambas, her second plate of the menu del dia. Lots of seafood here! A few other people had the gambas too and it was funny watching everyone dissect these little guys to get to the edible part. There is a saying in Spain that I learned when I lived here in 2002. When you're super sunburned they call you a gamba; now you can see why! We were so beat after the busy days we've had that we came back to the hotel around 5pm and took a siesta. Brian got up at 8pm to write a cover letter for a job, and I slept until 10pm! It's almost midnight here and we're about to venture out for dinner. The schedule is so different that our bodies have not quite adjusted, but I'm sure we'll get it down soon. Shab and I talked a lot today about how excited we are to get into our piso on Saturday and shop for groceries. Our other roomie Chelle (Michelle from UT) comes in on Saturday, so the whole piso group will be complete! No plans yet for tomorrow. Brian wants to buy a beanie, but aside from that we might just wander. I'd love to see the beach. Saturday is move-in day and grocery shopping. And then I think Sunday we'll take a trip to the school. Orientation is Monday, and I'll officially be on my own! I plan to search out a yoga studio and start building my little routine. The apartment-locating agency said the internet connection in our piso may be hit or miss, so I think I'll search out a good wi-fi spot too while I'm out and about Monday. 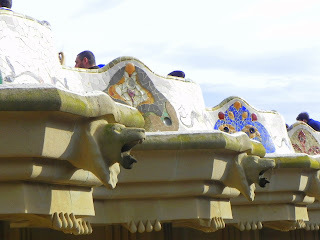 I've been enjoying blogging at the end of the day, but as most things go in Spain, I'm seeing that I may have to be a bit flexible depending on the connection. Nothing is ever certain or reliable here it seems. If you can get past the frustration, the uncertainty is kind of wonderful. Just when you think you have it down, Spain throws you for a loop and you're forced to try things a new way. Spontaneity at its best; straight from mama Spain. Buenas noches y hasta pronto!